Today we are scheduled to tour the facilities for the College of Science and the College of Education. The College of Science would be first since they are closer followed by a trip to Zakho, even further north in Kurdistan right up to the border with Turkey. It turns out that the College of Science is moving into brand new space on a new campus at the edge of Duhok. The campus is next to the cultural center where our workshops are held. As with most construction here, the work does not have to be complete before you start using the building. So looking at the “new” campus might not be what one would expect. For many buildings in town, the first floor is complete and actively used as a shop of some sort while the floors above are only a shell. Houses appear to follow a similar pattern. When you need more space, just add another floor on top. This reminds me of road construction. Everywhere we went, roads were in various states of repair including major roads (think interstates in the US). However, until the construction is finished, odd configurations and transitions occur. In more than one instance a road abruptly ended and cars traversed a rock/gravel path to an adjacent road, merging with the oncoming traffic and creating a big dust storm in the process. Remember it has not rained for several months. One big intersection of major roads was all rock and dust, no pavement. Every time we drove through this spot, many large trucks were moving around in the traffic, apparently part of the work. You know how in the US we have work zones with orange barrels and signs everywhere, taking many precautions for safety. No such thing in Iraq. In general, safety is the individual’s responsibility. If you fall off a cliff because there are no hand rails, it is your own fault. If you drive into a hole in the road because you didn’t see it, it is your own fault. One exception is crossing the street, which has its own rules. No running allowed even if a big Lexus SUV is bearing down on you. Ignore it. The one time we did see safety barriers ironically was on a trip way out in the country. A road was being repaired and had large sections of one lane dug up at various intervals – 50 feet of road missing with a 4 foot deep hole in its place. There was one little yellow flashing light marking the edge of most of the holes although some had only a few rocks marking the edge. Remember this is in the country with no street lights, which are very good in the city. To get around these holes, drivers made their own new roads on the shoulder or took over the opposite lane. 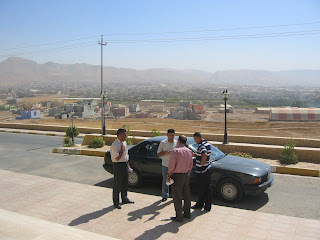 After the usual morning routine at the hotel, we first visited the College of Science in Duhok. We discovered their facilities are on par with or even better than ours back home (remember I said the colleges are new construction). 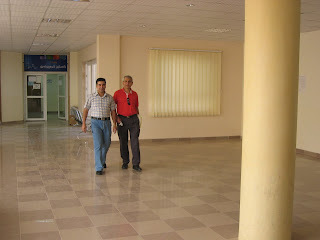 Marble is widely used for floors and bathrooms throughout Kurdistan and the College of Sciences is no exception. The center of the building was open from top to bottom with space for people to move and mingle. There was a ping pong table on the first floor. I plan on asking my Dean for one in the CAP building back home. Labs were well equipped with computers and projectors, though they were not networked very well (there is a real business opportunity here that Rahman and I should pursue!). Offices are about the same size as in the US, though sharing is more common. A cafeteria and library made the package complete. By the way, students here do not have their own textbooks, but must check them out of the library for a few days at a time. We heard that students do not use the books much; they depend solely on lecture material from their professor. At least in Kurdistan students have a good excuse for not reading the text. We have the same problem in the US trying to get students to read their books. Leaving Duhok, the trip to Zakho was only about 30 km and involved only one checkpoint. The road followed a valley for a while with a large mountain range in front of us, the border with Turkey. Turning east another mountain range loomed with Zakho on the other side of a mountain pass. The road over the pass reminded me of what Highway 421 looked like back in 70’s going up to Boone, though the Kurdistan road was much wider. They said many accidents occur on the road, especially in winter due to the steepness and the number of big trucks navigating the terrain. Sure enough, on our return trip that afternoon a truck had lost control and crashed into the side of the mountain. 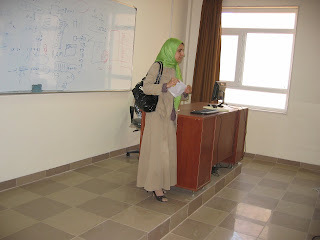 The College of Education building in Zakho was very similar to the College of Science though it had more computer labs for some reason. The Zakho campus was only three years old. Perhaps you are confused by the two different colleges both housing Computer Science Departments. We were too for a long time. Diverging from our story, a brief discussion of the education system in Kurdistan is due. Upon graduation from high school, students are ranked based on exam scores and placed in a particular subject of study based on the score. Highest scores go to medical school, next highest somewhere else, probably engineering, and so on. A student does not decide what he will study, it is chosen for him by the government. Why? Because the government pays for it. From what I was told, most Middle East countries operate in this socialist manner. Recently private universities have opened up for those who want to pursue a different subject. They must pay their own way of course. This forced study leads to the two departments in the two different colleges. The College of Science Computer Science Department gets students with higher exam scores than the College of Education Computer Science Department. Graduates from the College of Education will go back to high schools to teach. In the case of computer science, they go back and teach computer applications courses not computer science, so these students are really over qualified. After the facilities tour we met for while in their cafeteria to finalize the information for our report due at the ministry of education in a couple of days. Lunch followed just down the road next to the Tigris River. 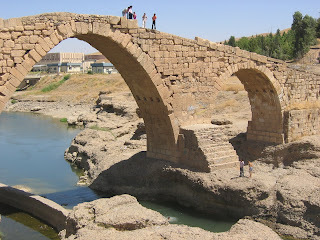 The river passes through Zakho and provides a good swimming hole for the local residents. Turns out that swimming is not very popular. Several of the graduate students with us could not swim; the pool at the hotel was not used much as one might think given the heat. Lunch was at a restaurant right on the river next to a really old bridge (several hundred years old) that arched high over the trickle of a river, about 15 meters (50 feet) at the highest point. As was the case with other rivers, one could see the water was usually much higher, though in this case there was still enough water for swimming, especially in some of the deeper holes in the rock riverbed. Yes, the bed of the river here appeared to be solid rock, which made for nice platforms to jump into the water. The most daring boys would jump from the top of bridge into a sliver of water about 15 feet wide 45 feet below. We tried not to get them too excited because they would show off for us visitors. Basima told us some boys died there recently when they hit rocks under the water. Zakho has a bazaar like Duhok, only smaller. I was in search of an outfit for Lillian and soon found something pink that I hoped would fit. I also saw a shop with traditional Kurdish outfits for boys – I wish I had bought one to add to Israel’s dress up collection. 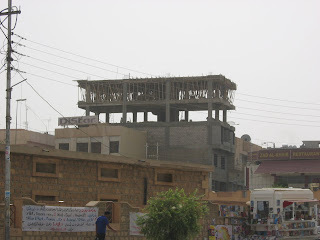 This was the only place I saw US soldiers the entire time I was in Iraq. Two soldiers walked down the street in the bazaar, apparently on holiday. There was some evidence of the US presence. At our hotel in Duhok, the Jiyan, a framed certificate of appreciation displayed in the lobby was given to the hotel for cooperation with various US armed forces groups. T-shirts and camouflaged clothing emblazoned with US Army were sold in the bazaar. The screen saver on the computer used by the secretary for the Vice President of International Relations for Duhok University was a picture of a US soldier standing on the street holding a very large gun. Other military personnel were clearly present, depending on where you were and who controlled that region – PDK, PUK, Turks, and some others I can’t remember. On our last day back in Erbil several military personnel mysteriously appeared outside the hotel. We found out later they were Special Forces assigned to guard public officials; one of whom must have been in our hotel. Following the travel back to Duhok and a couple of hours of rest that included a nap and a swim in the pool, we were back out on the street with Ari and Kovan as our guides. They had come to the hotel to meet with us to get information that would help them get to the US to study. Kovan is actually married and is coming to the US in a few months. His wife is already in the US. Marriage here is much different than in the US. I talked at length with Ari about his family’s views on marriage and the rules they follow. He estimates 10% of Kurds marry for love, by which I think he means feelings. The other 90% are based on relationship and availability. You don’t marry someone unless there is a relationship between the families, hence marrying relatives is common. Ari has 3 older brothers. The oldest is married and the second will likely marry next year. They must marry in the order of birth, so Ari cannot begin to think of marriage yet. Another difference is that many couples remain in the husband’s family home after marriage. Family relations mean a lot and are a source of life and even survival at times, as we heard stories from when Saddam was in power and families had to move back to villages where their families were from to escape. Several of the men we are working with are close to 30 and are not married. The chair of Computer Science, Dr. Adnan, is getting married shortly after we leave. He still lives at home, as do most children until they get married. Leaving the house at 18 is a foreign concept and dating as the US knows it does not exist. Wow, someone who thinks like I do. I could fit in here. Not only are family relations important, but everyone knows who lives nearby, neighbors know each other. Ari asked me if any Kurdish people live in Boone as if I should know the background of everyone living nearby. I explained that in the US we don’t even know our next door neighbors much less everyone in town. Our tour of the town started rather late, probably 9pm or after. We found a shortcut to the downtown market area, walking through a nice park with trees along a waterway. The water was coming from the Duhok dam which was right around the corner of a nearby mountain. Even though there was a strong smell of sewage in the area, several restaurants were spread along the waterway with people merrily eating. The evening was quiet. 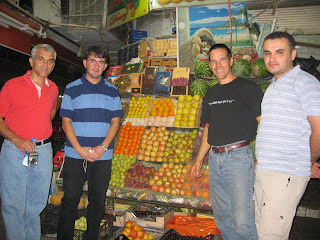 We bought some fresh fruit at a small shop where Ari tricked Rahman into not paying for the food. Recall that our hosts are very gracious and take offense at us paying for anything. 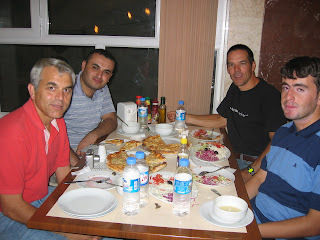 Being tired of Kurdish food, we sought out a western style pizza restaurant. The obligatory “salad” of cucumbers, cabbages, and tomatoes were served first, but then the pizza. Mushroom and chicken pizza that tasted just like pizza in the US except the chicken had some different spices on it. The day ended like all the others, except I did not get to type in my blog entry.